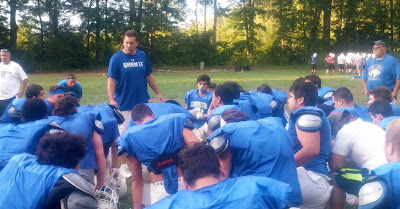 This is the second in our series of camp previews around CMass high school football. For our preview of Shepherd Hill, click here. Expectations are always high for the football team in Leominster, and this year is no different, with the Blue Devils returning stars at each level of their defense, and Duke commit quarterback Noah Gray on offense. This team, however, will be looking to change Leominster's hard luck in big games the past few years. Since coach Dave Palazzi led the Blue Devils to back-to-back Division 1 Central Super Bowl wins over rival St. John's in his first two seasons at the helm, fortune has not been on the Blue Devils' side in the postseason. In 2013, the first year of the MIAA's new state-wide playoff format, Leominster came into the D2 Central title game widely considered to be one of the best teams in the state. Boasting a 9-0 record, nobody had even played within single-digits of Leominster. But, the Blue Devils fell victim to St. John's quarterback Andrew Smiley's finest high school game, falling 51-42 as Smiley rushed for nearly 200 yards and three touchdowns, and passed for 250 yards and another three scores. The following year, Leominster fell victim to Fitchburg's magical run to a D2 Central title, falling 7-0 in one of Central MA's most emotional games in recent memory. Then, last season, the Blue Devils lost a 35-30 thriller to St. John's in the district semifinals. This year the MIAA has realigned football once again, and Leominster finds itself among familiar foes in Division 2 Central. Hard luck aside, the Blue Devils have the talent, and experience, to make it to Gillette Stadium for the D2 state championship game this year. Here's what you need to know about Leominster. Everybody wants to talk about Noah Gray, and with good reason, but Leominster could be all about its defense this year. With a linebacker group led by senior Anthony Dandini, an ESPN Boston preseason All-State selection, Leominster has the foundation for one of the state's best all-around defenses. Dandini is joined by senior strongside 'backer Dylan Tanner, and the Blue Devils are expecting big things from junior middle linebacker Isaac Phillips as well. Leominster returns a number of young players who contributed up front last year, starting with junior defensive end Cristian Nunez. With both the power to defend the run, and speed to get around the corner and harass quarterbacks, keep an eye on Nunez in 2016. The secondary returns a number of experienced players as well, as Gray is back to play safety, along with fellow seniors Travis Storm and converted linebacker Matt Pryce. Star running back Angel Colina is back at corner, and a number of younger guys will get their chance to contribute as well. The Blue Devils have done just about everything on offense under Palazzi the past few years, from spread and no-huddle to packed-in and smash mouth. This year, expect Leominster to be a bit more traditional in its offensive play calling, as Palazzi returns a talented backfield and promising offensive line. "We're gonna be more 'old school' run this year," coach Dave Palazzi said. "Also, we don't have the big, tall receivers that we've had in the past that you have to double team, so we're gonna have to spread the ball around a little more (in the passing game). Senior Angel Colina is back for another year as the starting running back, and seems poised for a breakout campaign. Leominster has the luxury of depth behind him, as Pryce returns and sophomore Adam Couch has worked his way into the rotation. That depth has allowed Leominster to move running back Travis Storm out to wide receiver. The senior excelled in space last year, and he'll form a speedy duo with junior Allen Link who started in the slot last year. The offensive line returns seniors Austin McDonald, Wes Corliss, Brendan Byrne, with a number of promising juniors fighting it out for starting spots. "I expect our line to be really good," Colina said. "And because of our line, we're gonna ground and pound the whole entire time." Obviously, much of the offenses' success will rest on Gray's shoulders. The senior has proven to be one of the best pure passers in the state, but he's also as physical a runner as you'll find. When the Blue Devils look to punish teams on the ground, Gray is very much a part of that equation, both on designed keepers, and when the play breaks down. Dandini is best known around the state for his work at linebacker, but the senior is also instrumental to what Leominster wants to do on offense, especially if the Blue Devils are looking to run the ball more in 2016. Dandini comes into the year as one of the best blocking fullbacks in the region, and his former backup, Dylan Tanner, has made a successful move out to tight end for his senior season. Both will be leaned on heavily for their blocking, but as we've seen in the recent past, Gray isn't afraid to throw the ball to his fullback out of the backfield or his tight end. "I'm excited about my new tight end this year, Dylan Tanner," Gray said. "He's a big body, and he's got some good hands, runs great routes, so I'll be looking at him a lot." "I've been working hard for four years, and the time has come," Dandini said. "You're a beast bro, just say it!" Gray interrupted. "Ok, I'm a beast," Dandini finished with a laugh. Leominster will certainly be ready for its regular season opener as the Blue Devils scrimmage D1 power Everett next Wednesday, then Tewksbury the following Saturday. That opener should be a good one, as the Blue Devils travel to Foley Stadium to play Doherty, then stay on the road for a game against Oakmont, and a big one at BC High. Leominster finally opens things up at Doyle Field with three straight against Divisional foes Wachusett, Algonquin and Shepherd Hill, before hitting the road again to face St. John's and Shrewsbury. On the whole, this looks like a whale of a schedule. Not only does Leominster only play three regular season home games (that obviously doesn't count Thanksgiving against Fitchburg), they face tough non-divisional tests against what should be an improved Doherty squad, and always tough BC High. Add in a tough road trip to St. John's and a brutal home test against Shepherd Hill, and the slate couldn't be much tougher. That said, Leominster won't be thought of as an underdog in any of those games. With Gray and Colina returning in the backfield, behind a promising line, we know Leominster will be able to run the ball, and Storm and Link have proven to be play makers with the ball in their hands. Coach Palazzi has been one of the better play callers and game planners in the state since taking over, and he'll have enough weapons to produce a very good offense this year, even after losing some size and speed at receiver. Defensively, the Blue Devils appear stacked at linebacker and in the secondary, which should give them the freedom to mix some things up, given all their experience. It starts with Nunez up front, but don't sleep on a bevy of different juniors and sophomore who will figure in as well. All in all, this looks like one of the best teams in the region, if not the state, and all the pieces are there to erase those heartbreaking memories from recent years. "I think our defense is gonna be pretty good, we've got a lot of guys back, including big boy over here," Pryce said, pointing at Dandini. "And offensively we should be pretty explosive with (Gray and Colina) returning in the backfield. I think we should be fine." If it all comes together, a trip to Gillette for the D2 state championship game could be in this team's future.